Without demanding too much effort, the Flume Trail offers hikers a good introduction to the Castle Crags. Beautiful creeks, human history, lovely forests and sweeping vistas all combine to make a satisfying outing that can be done throughout most of the year. The second bridge over Indian Creek. The Flume Trail in Castle Crags State Park is a nice way to experience a number of the parks great features without putting out too much effort. The first half of the trail is an easy, level path through beautiful forests, over a boisterous creek and along a historic flume, from which the trail gets its name. The flume was built to supply water to the nearby town of Castella. 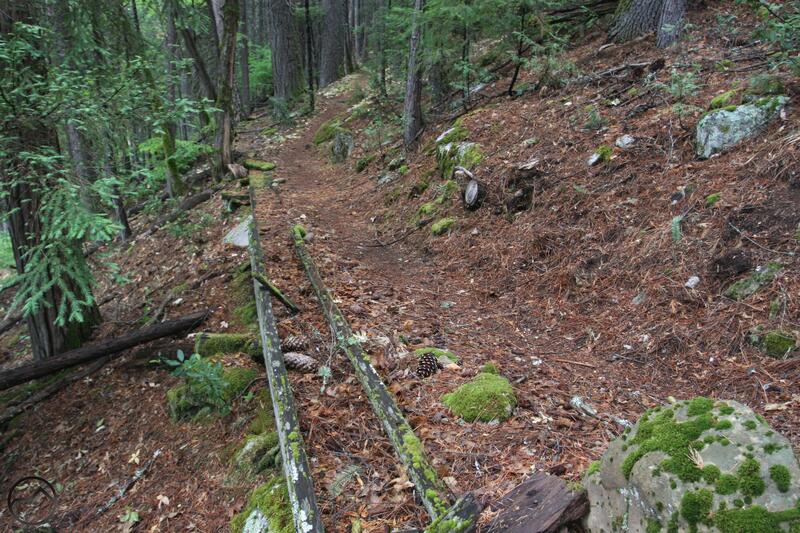 Much of the flume is gone but small sections of ditch and rotting timbers still remain and line the trail in places. 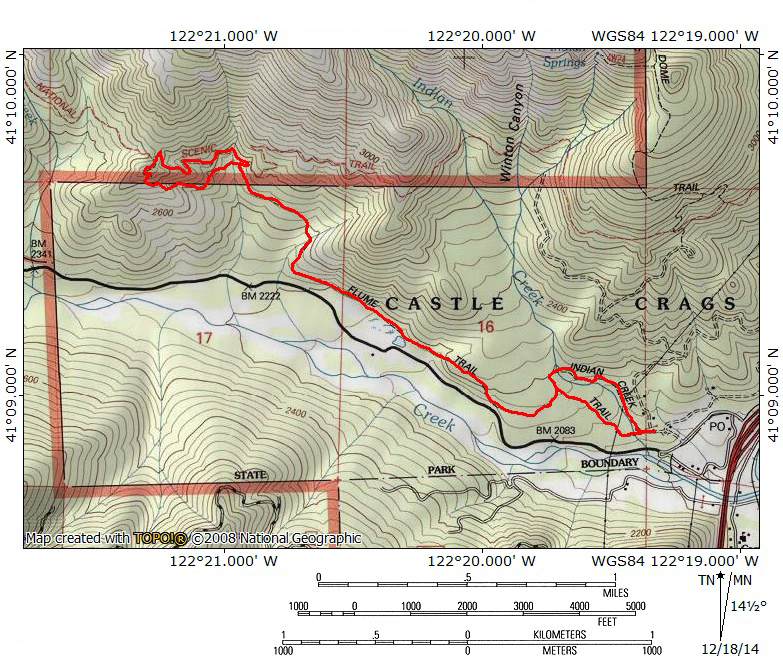 The latter half of the hike is more demanding as the trail climbs up onto the lower flanks of the Castle Crags to connect with the Pacific Crest Trail. The two trails combine to form a nice little loop that has great views of granite walls of the Castle Crags and sweeping vistas overlooking Castle Creek, where the dark peaks of the Grey Rocks gaze down ominously on their domain. 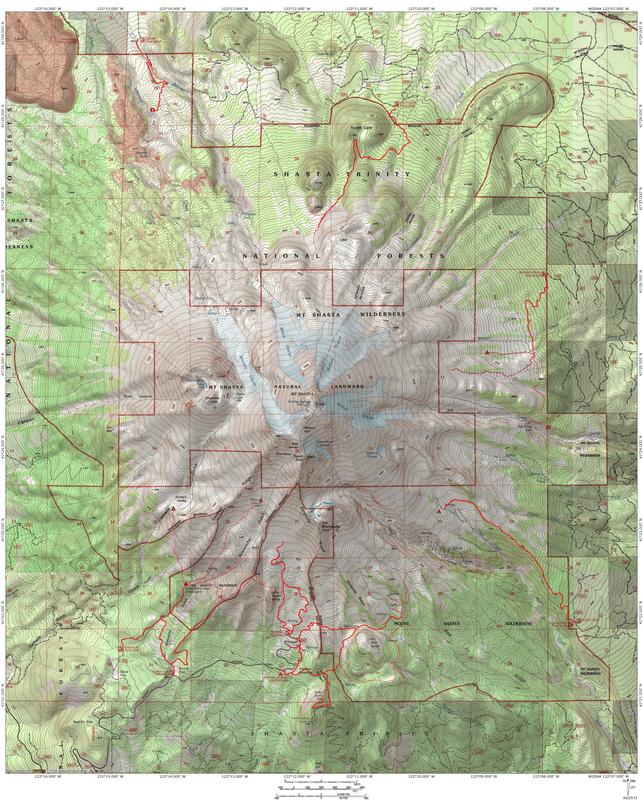 While it lacks the close exposure to the granite of the Crags themselves, the diversity of the Flume Trail makes it a good option for a well-rounded experience in one of the Mount Shasta area’s premier landmarks. The first bridge over Indian Creek. To reach the Flume Trail it is first necessary to hike on the Indian Creek Nature Trail. Find the beginning of the trail at the north end of the parking lot. The trail immediately drops down into the woods and arrives at a junction after only 0.1 miles. The Indian Creek Trail is a 1 mile loop. The Flume Trail begins at the far end of the loop, which makes returning on the second half of the loop a good option. Stay to the right and continue hiking through the woods. 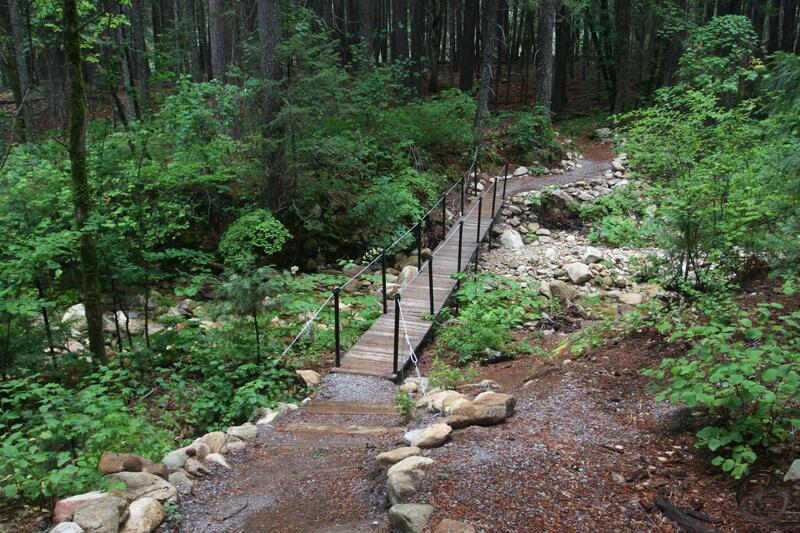 As you approach the end of the loop, cross over Indian Creek on a beautiful, rustic bridge. The creek originates from productive Indian Springs, 1,400 feet higher up the flanks of the Crags. Even when other creeks have dried up, the spring keeps Indian Creek flowing strong throughout the year. The spring can be visited on the Castle Dome Trail (Hike 42). Just past the bridge, the trail arrives at a fork, 0.55 miles from the trailhead. Turn right and begin hiking on the Flume Trail. A section of the old flume. 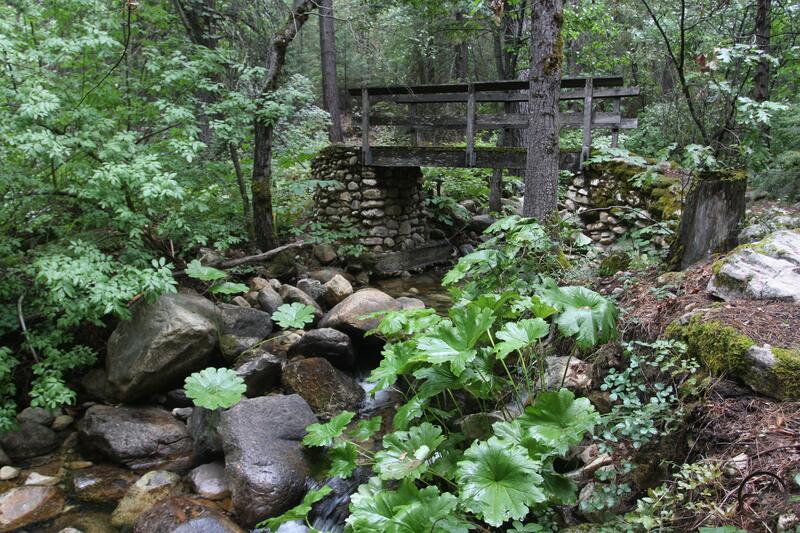 Once you are on the Flume Trail, the path descends gradually through thick forest and crosses over a small, seasonal stream on a rickety bridge. This is followed quickly by a short, rocky causeway. Begin looking for wooden planks on the left side of the trail. These are remnants of the old flume. The middle section of the hike follows the original path of the flume. The water flower through chutes constructed from the wood planks or through ditches dug into the ground. The remains of the water transporting system are evident for nearly a mile. After following the flume for 0.7 miles, the trail passes a small environmental campground. Outhouses, tables and other amenities are visible from the trail and a short spur drops down to the campground. If you are satisfied with the easy stroll to this point, the campground makes a good place to turn around and head back to the trailhead. If you want to climb high enough to enjoy views of the Crags and Castle Creek canyon, continue hiking to the west on the trail. About 0.25 miles past the campground, the path makes a sharp turn to the north and begins to climb steeply. It soon turns back to the west and passes through a large, lovely oak forest. At the far end of the oak woods, the trail arrives at the junction that begins the loop into the Crags, 2.35 miles from the beginning of the hike. Turn right to start the loop. A good view of the Castle Crags from the loop trail. Near the junction is small Dump Creek. The first few yards of the trail pass the creek but a pair of switchbacks soon leads you away from the water. Join the PCT at the top of the switchbacks and turn left. The trail quickly crosses over the creek and begins to climb out of the small drainage. Nearly 0.3 miles from the creek the PCT climbs up out of a small gully and makes a tight, hairpin turn. 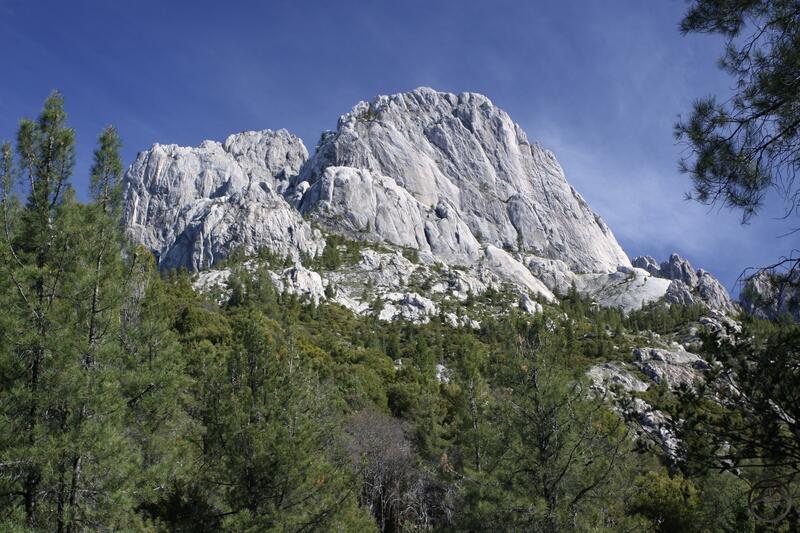 Look to the north for a fantastic view of the imposing granite cliffs of the Castle Crags. These peaks seem like misplaced towers of the Sierra Nevada. Another 0.15 miles further brings you to another junction. Turn left to return to the Flume Trail. The path climbs up to the top of a knoll where a short, easy scramble over small rocks leads to an awesome overlook above Castle Creek. The creek can be seen and heard crashing through the canyon 700 feet below. To the east, wooded Girard Ridge rises above the canyon of the Sacramento River. To the west the mysterious Grey Rocks stand guard over the region. From the overlook the trail begins to descend, making several switchbacks down a remote, rarely traveled hillside. The trail crosses Dump Creek and arrives at the junction at the beginning of the loop 0.6 miles after leaving the overlook. From there, hike back along the Flume Trail for 1.75 miles to the junction with the Indian Creek Nature Trail. This time, turn right and hike the second half of the little loop. The path travels through the woods with a brief open spot that has a nice view of the Castle Crags. It then descends down to Indian Creek and crosses over an unusual but very scenic bridge. This spot on Indian Creek is one of the prettiest on the entire hike and makes a good place to sit and put your feet in the water. Beyond the creek it is only 0.1 miles back to the trailhead. From the Castella exit on I-5, proceed a few hundred yards west on Castle Creek Road to the entrance to the State Park. Turn right into the park entrance and pay the $8.00 at the guard station. Turn left immediately after the guard station and park in the large parking lot.